To four college students who weren’t born yet during the EDSA Revolution, let alone Martial Law, the atrocities committed under the rule of former President Ferdinand Marcos had just become more real as compared to what they learned in their history classes. BS Social Work seniors Camille Barlis, Airah Lorico, Eunice Tan, and Nikki Lagasca took part in InterAksyon’s Memory Project at the University of the Philippines Diliman on Friday, September 21, on the 40th anniversary of the declaration of Martial Law. Here, they read aloud and recorded the sworn testimonies of survivors who were tortured, relatives who lost their loved ones to enforced disappearances, and even persons who witnessed their neighbors die in summary executions. It was an “agitating” experience for Lorico to learn the testimonies through the words of the human rights victims themselves. She admitted being emotionally affected by the case she read since the victim was someone accused of something he did not commit. While human rights violations continue to occur today, Barlis, 20, said that these were worse, “more blatant,” during Martial Law. 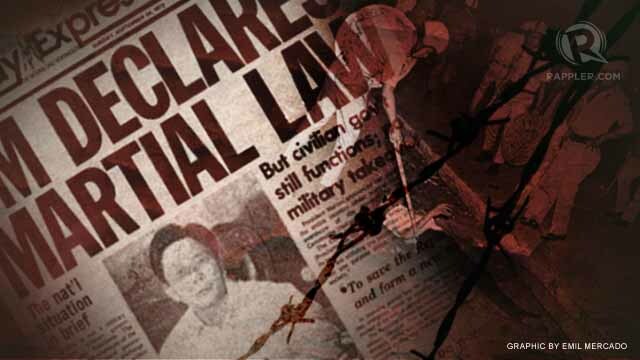 While those atrocities were no longer new to them, Lagasca said she was given a clearer picture of Martial Law. “We know more details, that there was violence under the Marcos government, as in, people were really getting killed. Even the students who were just studying got involved, and it had a huge psychological effect on them. Because of this, their studies were affected,” she said. All four were in agreement that it “felt good” to take part in reliving history. “We just used our voices, but were able to help and interact (with the victims),” said Lagasca. The Memory Project brings to UP copies of the affidavits of 10,000 human rights victims during the Marcos era, allowing the students to forge a personal relationship with those who lived through those days, whether dead or live. Based at room 109 of Palma Hall, the activity ends on Friday this week. More participants are invited to take part in bringing history to the digital age.